A new paper production technique promises to reduce the industry’s reliance on wood. Researchers have developed a way to turn cow and elephant dung into paper. Traditional paper production methods involve the chemical and mechanical breakdown of raw wood into pulp that can be turned into paper products, which can be an energy intensive process. As researchers explained Wednesday at the annual national meeting of the American Chemical Society in New Orleans, animals can save the paper industry energy by performing the breakdown functions themselves. In Africa, sanctuaries, reservations and national parks host thousands of elephants. Dung is available in massive quantities. The same goes for cattle ranches in Europe and North America. A sodium hydroxide solution treatment helps separate lignin and impurities, including dead cells, from the cellulose. The separated cellulose is then bleached with sodium hypochlorite. No additional processes are needed to break down the celluloses before its entry into traditional paper production methods. 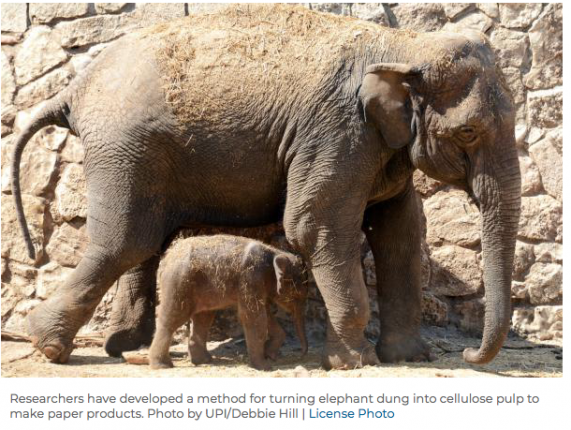 The digestion process inside the guts of cows and elephants works to grind the cellulose into nanofibers. The nanopaper produced by processing animal dung could be used to make a variety of products, including wastewater filtering systems. Scientists are currently exploring the possibility of combing their nanocellulose derivation process with other technologies that turn animal manure into sources of fuel.